Gin berry growing plant of the genus Glycosmis also known as Orange berry Glycosmis pentaphylla, Gin berry perennial evergreen plant that grow as shrub‎ or small tree, the fruits edible and also used as ornamental plant and medical uses, grow in tropic, subtropical or mediterranean climate and growing in hardiness zone 10+. Flower color white the flowers grow in inflorescence. Fruit edible color transparent red-pink, the size 0.5-1 cm with big seeds inside the seed is not edible. 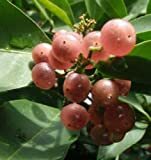 What can be done with big quantities of Gin berry fruits?